Late afternoon storms are not as organized as expected earlier today, with most widely scattered cells remaining north of the metro. Late evening storms are still on track with an ETA in the far northern metro after 8pm and closer to 9-10pm in the city and after 11pm in north MS. Primary threat remains high wind with a lesser threat of hail and an isolated tornado. 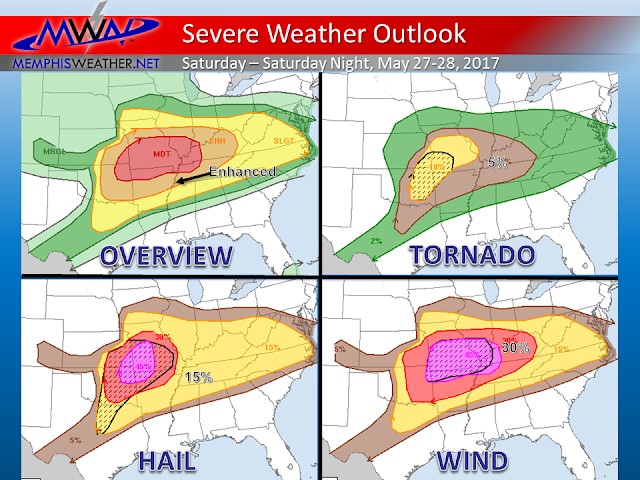 An updated severe weather graphic can be found immediately below. Latest information will be on our social media feeds and app. Severe weather remains a distinct possibility later today and tonight. Up until about 9am (as a few storms were sliding by safely to our north), I expected the only storms we would be dealing with would be an overnight complex (mesoscale convective system, MCS, is the technical term). As morning model data started coming in, particularly the hourly high-resolution data, it became clear that we would need to carefully watch the late afternoon hours as well. There are some indications, albeit varied, that a cluster of storms in southern MO this morning would grow and take a similar path to the storms earlier this morning, but moving through a more unstable environment, they could build south into the metro by late afternoon to early evening. Thus, a change to the forecast to include that chance. These storms, if they get this far south, will bring the possibility of heavy rain, some hail, and severe wind (60+ mph), as well as lightning of course. If you have outdoor plans, keep a close eye on the sky and your favorite weather sources and have a plan B! The early "wave" of storms could also do a number on the potential for severe weather overnight. Though storms would still be expected, they could potentially be moving into a much less favorable environment for severe weather. The arrival timing on overnight storms remains around 11pm-2am 8pm-2am (earlier north of Memphis, later south). If the atmosphere is unadulterated by prior storms, there is a good chance they could be severe with high wind, hail, constant lightning, and heavy rain that could cause localized flash flooding. In addition, a supercell storm embedded in a squall line could develop enough rotation to produce a brief tornado. If the overnight storms move into a more stable environment behind prior storms, the severe potential likely goes down, but the storms would still be expected to occur. Severe weather probabilities are for within 25 miles of a point. 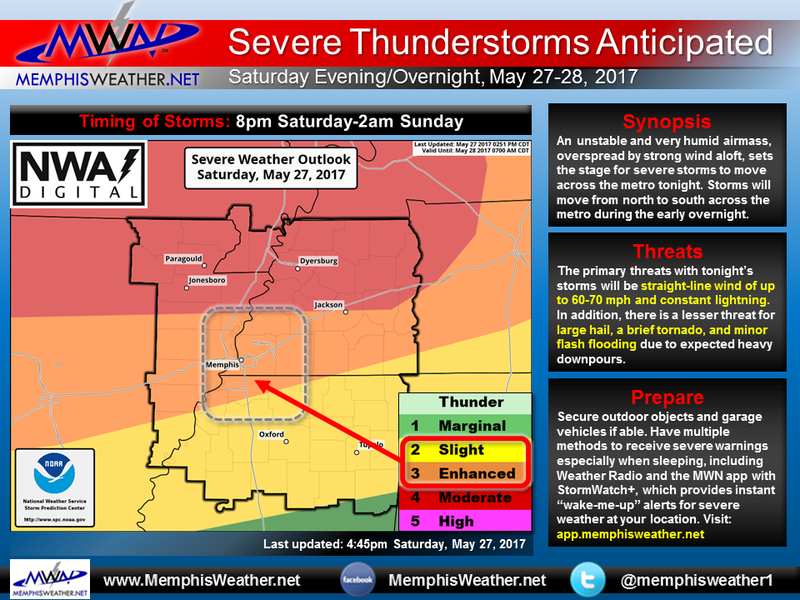 Those probabilities for Memphis are printed on the graphic. Hatched areas have decent probabilities of "significant severe" storms - very strong wind, large hail, or strong tornadoes. To our north, in the Moderate Risk, we could see images tomorrow of widespread wind damage across a large area from southern MO into the MS/OH River conjunction. Please stay tuned to our social media channels for the latest information. They are linked below. 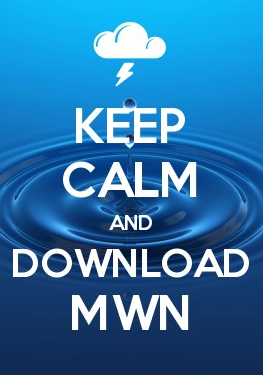 In addition, due to the possibility of overnight severe weather, we highly recommend you download the MWN mobile app if you haven't already, then add StormWatch+ Alerts and set them up for your specific location so that you can receive push notifications of impending severe weather for locations YOU are concerned about. Again, links below. Rain, rain, go away... it's Memphis in May!